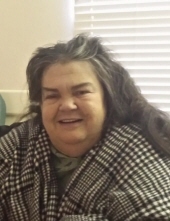 Susan Dawn Robertson, age 64 of Breckenridge, passed away Friday, February 1, 2019. Memorial services will be held on February 8, 2019, at 2 pm at Kingdom Builders Fellowship in Eastland, Texas, with Danny Brown officiating the service. Susan Dawn Stillwell was born July 16, 1954 in Fort Worth, Texas to Bob and Bea Stillwell. Susan graduated high school from the Fort Worth school system. She later met and fell in love with her husband, Larry Robertson of 41 years. The couple resided here in Breckenridge for a large part of their marriage. Susan worked as a hospital dietician and a nurse’s aide for the majority of her working career. She is a member of Kingdom Builders Church in Eastland, Texas. Susan is preceded in death by her parents and her son, Larry Joe Robertson. Mrs. Robertson is survived by her husband, Larry Robertson, daughter, Mary Robertson and four grandchildren all of Breckenridge. "Email Address" would like to share the life celebration of Susan Dawn Robertson. Click on the "link" to go to share a favorite memory or leave a condolence message for the family.